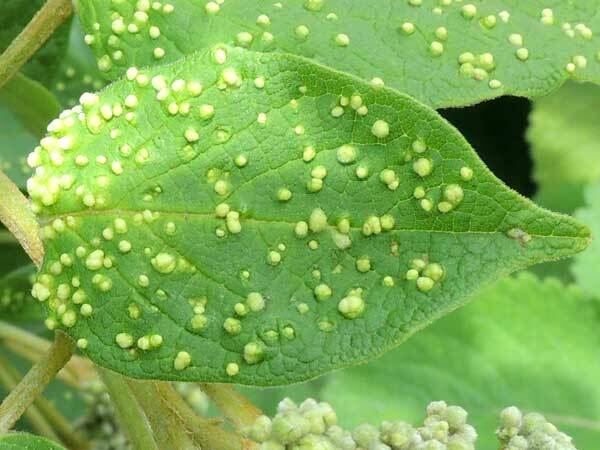 Leaf of a Cordia with numerous leaf galls likely caused by gall mites. Iten, Kenya. July 2014. Even through a 10x magnifier, the minute arthropods responsible for these plant galls are difficult to see. Under a dissecting scope the galls can be opened carefully to reveal the mites inside. I have found this Clerodendron in several areas of the Rift Valley Highlands, and in every case the mite-produced galls are present! It seems to be a tight relationship between the parasitic arthropod and the plant. I suspect that the plant benefits in some way. Perhaps the leaves are more distasteful to macro-herbivores? Copyright Michael J. Plagens. Page created 10 November 2014.